Earthquake Prediction: Yellowstone volcano: How scientists can PREDICT when next HUGE earthquake will strike? Yellowstone volcano: How scientists can PREDICT when next HUGE earthquake will strike? YELLOWSTONE volcano officials have revealed major earthquakes are a bigger concern than the supervolcano erupting – but how cans scientists predict these tremors? A magnitude 7 earthquake is more likely to strike sometime in the future than most people realise, geologists at Yellowstone National Park revealed. Yellowstone scientist and United States Geological Survey (USGS) volcano expert Michael Poland said such quakes can happen and “will happen in the future”. Speaking to USA Today, the Yellowstone geologist said magnitude 7 earthquakes are currently the “biggest concern” for scientists. The Yellowstone earthquake triggered devastating landslides near an occupied campsite, killing 28 people and shifting 80 million tonnes of rock and soil. The potential destructive force of another such tremor is incredibly terrifying, especially now that Yellowstone’s annual visitors are in the millions. So what exactly is being done to predict future cataclysmic earthquakes from claiming more lives? Unfortunately there is nothing that can be done to predict earthquakes in advance. Geology professor Jamie Farrell, University of Utah, said predicting earthquakes is impossible but studying past data might point scientists in the right direction. 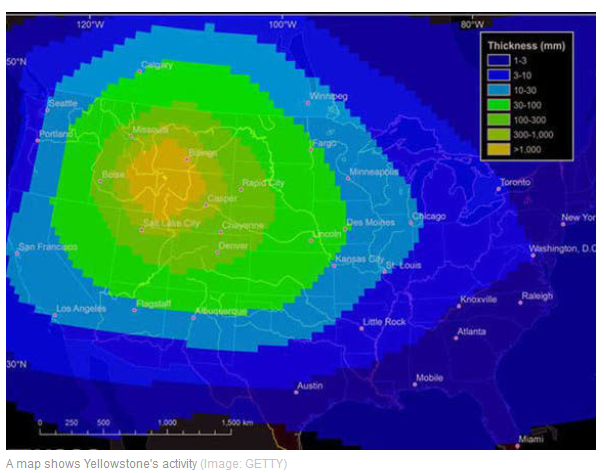 The Yellowstone expert said the supervolcano complex is one of the best “seismically monitored regions in the world”. There are a total of 101 various monitoring instruments dotting the Yellowstone landscape, including an array of cameras, GPS stations, 33 seismometers, temperature gauges and tiltmeters. The network of instruments constantly measures seismic activity in the park for signs of ground deformation, seismic activity and other indicators of tectonic unrest. Since July 25 alone, the instruments have detected 120 local earthquakes between depths of 3.1 miles (5km) to 12.42 miles (20km) below the surface. At least four of the recorded quakes were magnitude 6 or over. Professor Farrell said: “We can’t predict them, but by looking at past data, these earthquakes tend to cluster in areas. There are anywhere between 1,500 and 2,500 annual earthquakes at the supervolcano complex. But most of these quakes are too weak or to deep to be noticed by anyone other than Yellowstone’s scientists monitoring the park. If a magnitude 7 earthquake struck today it would likely be much more devastating than the 1959 quake. And the possibility of it happening is relatively high said Dr Poland, when compared to the threat of Yellowstone volcano erupting. The geologist warned unlike the theoretical volcanic eruption, a magnitude 7 tremor is something that happens “on a human life scale”. But Professor Farrell argued even the possibility of that happening at all is a very unlikely event. He said: “We like to talk about these big, grandiose things happening like big earthquakes or are volcanic eruptions, but those are highly unlikely events. Most of the deaths that occur in Yellowstone happen after hapless tourists disturb the park’s population of wild bear and bison or when they get too close to Yellowstone’s acidic hot springs and scorching geysers.